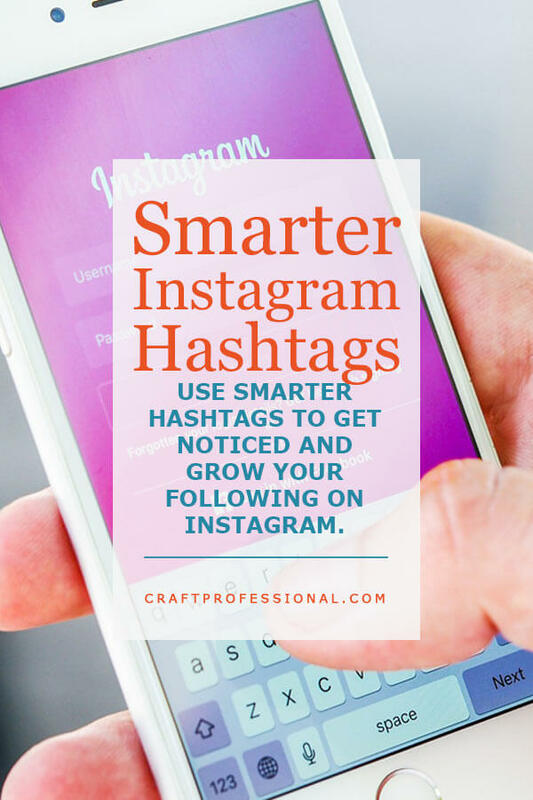 Understand what you're trying to accomplish with hashtags, and Use better, more strategic hashtags to get noticed and grow your following on Instagram. 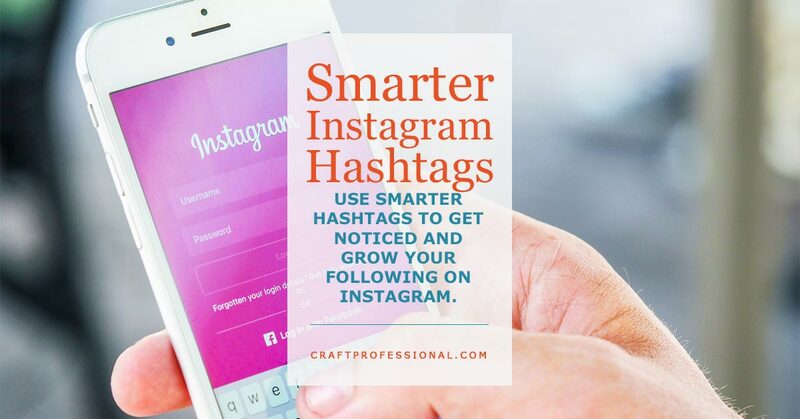 Smart, strategic use of Instagram hashtags is an important component in growing your following and improving your exposure on this social media platform without using spammy tricks. If you want your posts to be found on Instagram's search, you must use hashtags. Instagram's search tool does not include words you type into the comment section unless they are proceeded by a #. For example, if you captioned a photo, "Just finished up a new batch of handmade soap this morning." none of that would be found in Instagram's search because there are no hashtags. Instead, if you wrote, "Just finished up a new batch of #handmadesoap this morning." then your image will appear somewhere in the results when someone searches for handmadesoap or #handmadesoap on Instagram. If you want to maximize your exposure, using strategic Instagram hashtags is essential. To help you use hashtags more effectively and gain more visibility on Instagram, we'll work through a six step process. This system takes some work to set up on the front end, but once you have it in place, you'll be able to use hashtags effectively and efficiently. Understand why you are using hashtags in your Instagram posts. Find Instagram hashtags your target customer would use to search for a business like yours. Make sure the hashtags you choose aren't too competitive. Create lists of winnable Instagram hashtags that fit the types of posts you'll likely share. Decide how you'll save your lists of hashtags, so you have easy access to them any time you want to post on Instagram. When you're posting to Instagram, add relevant hashtags from your lists. You can also do a quick search to find any other hashtags that are relevant to your post but not already on your list. Before you decide what hashtags you'll use, you need to understand what you're trying to accomplish when using them. You'll make smarter decisions about the hashtags you choose if you understand why you're using them in the first place. In short, you use Instagram hashtags to get found on Instagram search. When someone does a search on the Instagram app or on the website, the results show the most popular images tagged with that hashtag as well as the most recent images with that hashtag. I won't pretend to understand all of the details of Instagram's algorithm, but, in general, the top results are some combination of posts with the most likes and comments. More recent posts get a boost in popularity ranking as well. Ideally, to get more exposure, you want to get your posts in the most popular results for that hashtag, and you want your image to hang around in the most recent posts for a while. How do you accomplish this feat? First, by posting great content, but beyond that, by using hashtags that are popular enough to generate views, but not so over-used that you can't compete. When you're starting out, it's tough to compete with the accounts that have thousands of followers. All of their followers generate likes and comments for their posts, and those likes and comments move them up to the most popular results, where they get more likes and comments. Accounts with a lot of engaged followers might be able to get away with using a generic hashtag like #handmade, but a newer account cannot win for something that competitive because a newer account doesn't have the followers to give their posts that initial engagement boost. So, how do you win when you're establishing a newer account? Use less competitive hashtags. It takes some brainstorming to generate a list of good hashtags. I initially spent a couple of days working on a base of good hashtags, and I'll explain the process I used when we get to steps 2 and 3. I also use Tailwind's hashtag finder to search for additional hashtags that suit my post. Avoid generic Lists of hashtags. Do Your Own Research. If you Google something like "Instagram hashtags for crafts" you'll find a bunch of articles with lists of generic hashtags that fit handmade products. Do not rely on these lists. Any of the lists I've seen aren't great. The hashtags are too generic. Do your own research. You'll almost certainly find much better options. Keep reading, and I'll show you how to do that research. How Do You Find the Right Instagram Hashtags for Your Business? First, you need an Instagram account. Before you can start exploring Instagram, you'll need an account. If you don't have one already, you can download the Instagram app to a mobile device and follow the instructions to create an account. If you prefer to work on your computer, you can go to Instagram.com and create an account. If you'd like some detailed instructions for setting up a new account, you'll find that information in Instagram's help center. You'll be gathering a lot of information as you do this research, so be ready to make notes. I did all of this work on my computer. I find it easier than working on the Instagram app, so the instructions here assume you're working on the desktop version of Instagram. Start with a few words or phrases your target customer might use to find a product like yours. You're going to research each of these words or phrases on Instagram. Don't worry about brainstorming too many keywords to start. This kind of research takes on a life of its own. As you do your research, you'll almost certainly find more and more keywords to explore. Start by typing one of the words or phrases your target customer might use into Instagram's search bar. Notice, as you type your search term into Instagram's search bar, several suggestions will pop up. Among these suggestions you'll find the relevant, winnable hashtags you can use to increase your visibility on Instagram. Be aware, you can scroll through the results that pop up. Put your cursor over the list of hashtags, and start scrolling to find a long list of ideas. As you scroll make note of any hashtags that look promising. When you type a keyword into Instagram's search bar, you'll notice that each suggestion that pops up has a number below it. That number indicates how many posts on Instagram use that hashtag. It's not a perfect measurement, but it gives you a reasonable indication of how competitive a hashtag is. The higher the number, the more people are competing to be found for that hashtag. When your account is new, you need to find hashtags that aren't too competitive. As a very general guideline, look for hashtags with fewer than 100,000 posts when you're getting started. When you have plenty of engaged followers, you can go after more competitive hashtags. If you want to throw in a few competitive hashtags, that's fine. Just be sure to mix it up with more winnable ones as well. Some Instagrammers like to use a mix of more competitive and less competitive hashtags. They figure they have a better chance of making it to the top posts with the less competitive hashtags, and, if they are lucky, they might get some good exposure with the more popular hashtags. Let's explore the hashtag #shopsmall. In the generic lists of "good" hashtags that some bloggers will tell you to use, #shopsmall is one that comes up frequently. I see a lot of craft professionals using this Instagram hashtag, so it's a good one to explore. Go on over to Instagram.com. Type #shopsmall into the search bar, and see what you get. Be sure to include the # in your search to eliminate any Instagram accounts with shop small in the name. You're just looking for posts using the hashtag. Searching #shopsmall will give you only posts that use the hashtag. Searching shopsmall (with no #) will give you the hashtag, plus accounts that have shop small in their name. As of this writing, there are over 16,000,000 posts tagged with the hashtag #shopsmall. When I checked the #shopsmall search results, the top nine most popular items have between 300 and 1700 likes, plus several comments. They come from accounts with thousands of followers. On top of that, there were 185 new posts made with the hashtag shopsmall within 5 minutes. I don't know how many posts the average person will scroll through. I certainly don't look at much more than 100 at a time. That means, a post with the hashtag shopsmall is practically invisible for that hashtag after less than 5 minutes unless it can generate several hundred likes to put it in the most popular posts. Can you compete with those numbers? If you have a large, established, engaged following, and you can compete, great. If you're just starting out, though, that hashtag is way too competitive. You need to find something that is more winnable. Think of the general categories of items you might post on Instagram. Research each topic using the Instagram search tool as described in steps 2 and 3 above. As you research each topic, create lists of winnable hashtags suitable for those categories. It will take you a while to make these lists, but, going forward, it will save you time each time you post to Instagram. If you know you're ready with some good hashtags, you'll be more likely to use hashtags consistently as you share photos on Instagram. If you have a list of good hashtags that are relevant to most things you're likely to post on Instagram, you'll simply need to go to that list when you're posting on Instagram, copy your hashtags, and paste them into your Instagram post. What hashtags are your customers using to find images like yours on Instagram? While you're brainstorming hashtags, keep in mind, customers and experts in your niche can use quite different hashtags to search for the same item. For example, if I made semiprecious gemstone jewelry, I might tag my latest creation (assuming it was an amethyst necklace) with #amethystnecklace to help potential customers find it. It's not terribly competitive, and it's a hashtag someone who's interested in that product might use. On the other hand, I might not be in a hurry to use #lapidary or #lapidaryartist to connect with customers. They are both not terribly competitive, but they are technical terms that a customer is not likely to think of. If I wanted to be found by other jewelry artists, or gemologists, then I certainly would consider using those hashtags. I use Tailwind to schedule my posts on Instagram, so I also use it to manage my hashtags. I have many lists of hashtags stored on Tailwind. Their hashtag management tool is a handy feature that simplifies my work flow and allows me to quickly find the hashtags I need for a post. Before Tailwind introduced their hashtag tool, I used the Microsoft OneNote app to store my lists of hashtags. When I was ready to post to Instagram, I opened up the OneNote app, where I stored my lists of hashtags. I would find the list of hashtags that were most relevant to my post, copy them, and then paste them in my Instagram post. Storing hashtags on OneNote is a less streamlined option than storing hashtags with Tailwind. However, if a Tailwind subscription isn't in your business budget, OneNote is a free alternative that works. You'll just have to toggle between the OneNate app and the Instagram app to make posts. If you're not sure which option is best for you, you can always trial Tailwind for free and see if it fits with your budget and the way you like to work. If you've done all of the work outlined in the first 5 steps, adding hashtags to your posts will be easy. You'll simply need to navigate to your list of hashtags, find the ones most relevant to your post, and copy and paste (or click a button if you're using Tailwind). Of course, it can be helpful to mix up your hashtags a bit. Your list of researched options won't always reflect every post you share, and you can always add more. I might want to share a photo of pretty evergreen wreaths at a local Christmas market. I have a list of hashtags related to Christmas craft shows, and many of those would be relevant to that type of photo, so I'd look through that list and add any that made sense. I don't have a hashtag list related to wreaths or Christmas decorations because I don't often post about those topics. However, they are relevant to that particular photo, so I can do a quick search (as described in steps 2 and 3) and find a couple of winnable hashtags related to Christmas wreaths. How Many Instagram Hashtags Should You Use in a Post? You'll find a lot of advice telling you it's not cool to use more than three or four hashtags. I say forget that advice, particularly when you're growing a new Instagram account. You can't afford to be too cool for hashtags. Hashtags aren't quite as important to people who already have a large, engaged Instagram following. They can get plenty of likes and comments from their existing followers. It's easier for those people to tell you to limit hashtags because they've grown to a point at which they don't need them as much. Instagram allows you to use 30 hashtags. I say, use them all. Or, at least, use as many relevant ones as you can find. Where Should You Put Your Instagram Hashtags? You can put Instagram hashtags in the caption of your photo, or in the first comment. I put mine in the caption of my photo because, honestly, I don't think people have a problem with hashtags on Instagram. They know hashtags are an intrinsic part of the platform, so I don't feel the need to hide them. If do you prefer to be more discreet with your hashtags, you can add them to the first comment in your post. Using this method adds an extra step to your workflow, but some people take the time to post this way because they prefer the way it looks. Jenn Herman, who is a well-known Instagram expert, says you can put your Instagram hashtags wherever you like (in the caption or the first comment). Jenn says there's no research that proves one strategy is more effective than the other. It's just a matter of your personal taste and what works best with your preferred workflow. Good hashtag use is essential to being found on Instagram. Use them, and use many of them. We are not too cool for hashtags! Research them wisely. Don't accept a generic list created by someone else who doesn't know your customers and your business. And don't just copy hashtags you see others using. They might work for someone else because they have a larger following, or they are targeting different people. They may not work for you. Take your time to research relevant keywords people interested in your niche might use to search for images like yours. Save lists of hashtags so it's easy to copy and paste them to your post whenever you post something new on Instagram. Ensure your hashtags aren't too competitive, so your posts have a chance of getting some attention, knowing that you can use more competitive keywords as your account grows. Finally, set up an efficient system for storing your lists of Instagram hashtags, so you can find them and easily add them whenever you post to Instagram. Learn more about how to grow your business with Instagram. Is Instagram Marketing Right For Your Business? Solopreneurs have limited time. You can't do everything. So, should you be doing Instagram? Read more here to determine if Instagram marketing is right for growing your craft business. Get Found On Instagram Search: Learn how Instagram's search tool works and boost your exposure on the platform. Get More Instagram Followers: How to build an engaged Instagram following without using spammy techniques that could get you in trouble.